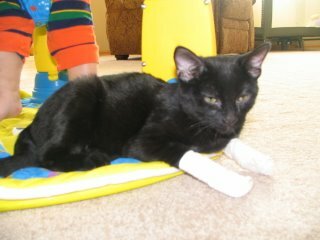 Batman (or Dark Vader, which is Carter's new name for him) was declawed yesterday and is healing from his surgery. Carter started crying when he first saw him with his bandages on. It is a sight! He'll be fine after a week or so of special attention. We had the surgery scheduled for the end of November, but moved it up because Batman was clawing at Jack's feet hanging from his exer-saucer. He thought he was a toy! You're pure evil. At least Ceason is sympathetic!!! !